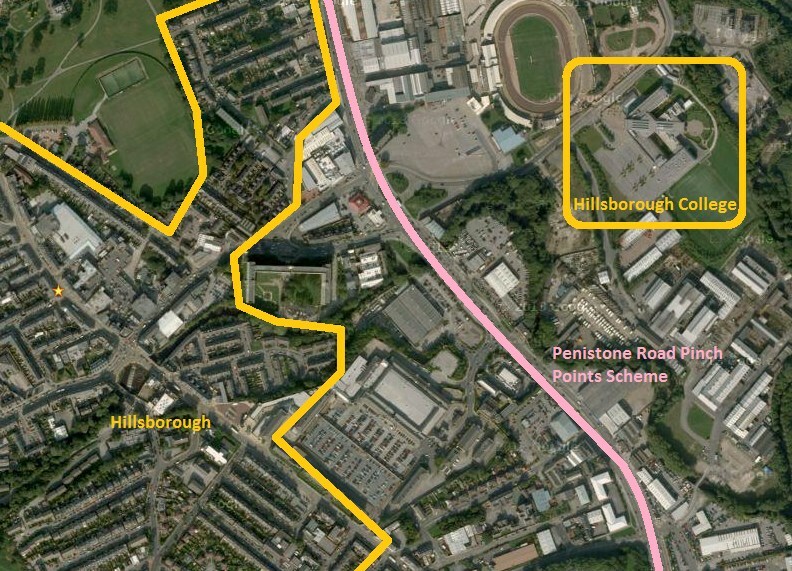 Part of the Penistone Road Pinch Points & Better Buses scheme is across the two main desire lines to Hillsborough college. From Hillsborough and the public transport interchange there, and from the bus stop on the west side of Penistone Road. You can review the scheme drawings here. The design decisions made for this junction show complete contempt for anyone walking or cycling to college (or accessing the Penistone Road cycle track). 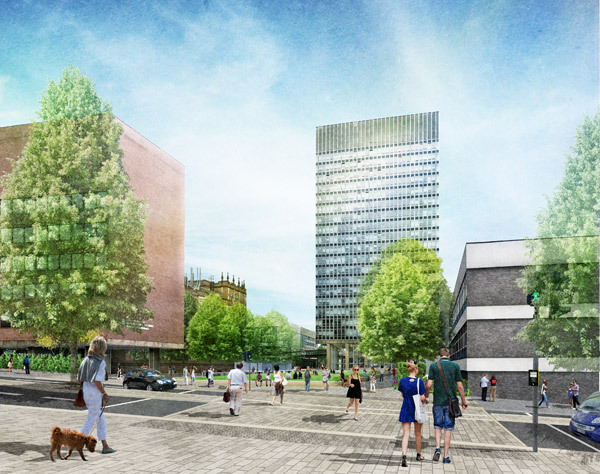 It’s abundantly clear that when designing this scheme Sheffield City Council had zero regard for their needs and have given zero consideration to their needs. The desire lines look something like this. The crossings over Penistone Road that pedestrians and cyclists can use are numbered. 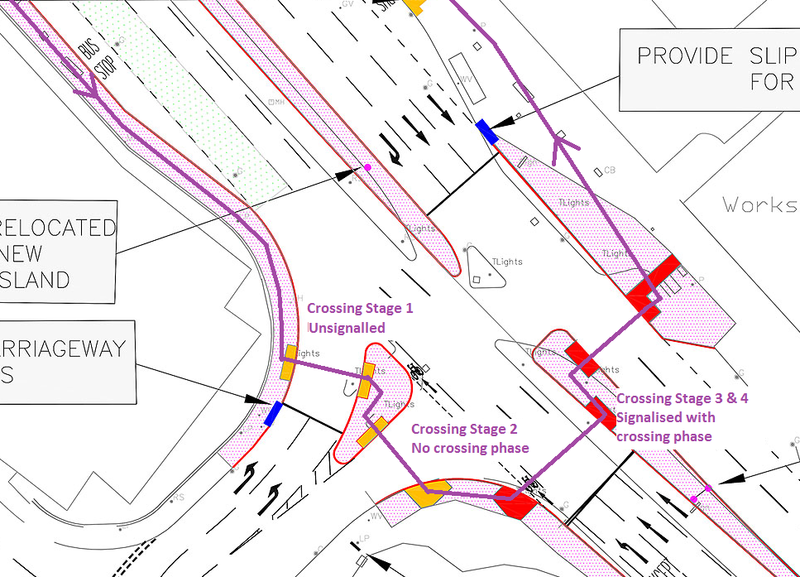 The biggest impact for these users is that the crossings over Penistone Road have been changed. So, with crossing #2 removed, crossing #1 is now significantly overloaded and hasn’t been designed for the volume of people using it. This photo shows just how bad it can get. People have to wait on intermediary islands because there’s not enough space on the next. A bit like the computer game frogger! This video shows the impact on crossing #1 since crossing #2 has been removed. In summary this video shows. People waiting in the road because there’s not enough room on the crossing island. People not crossing and waiting for the next phase before they cross because there’s not enough room to cross. Green lights for motor traffic before people have finished crossing and vehicles driving towards people still crossing. Crossing #3 has been introduced. It is a 4 stage crossing, the first two stages are unsignalled (one has a crossing phase, the other doesn’t, there are always cars turning in on a green light), the other two stages are a toucan crossing. It is not on the pedestrian desire line and people who used to use crossing #2 will not use it, it’s in the wrong direction! Crossing #2 used to take 40 seconds to get across the road, it’s now gone 🙁 And crossing #1? It’s an epic 4 stage crossing, with pens for pedestrians and tiny islands. 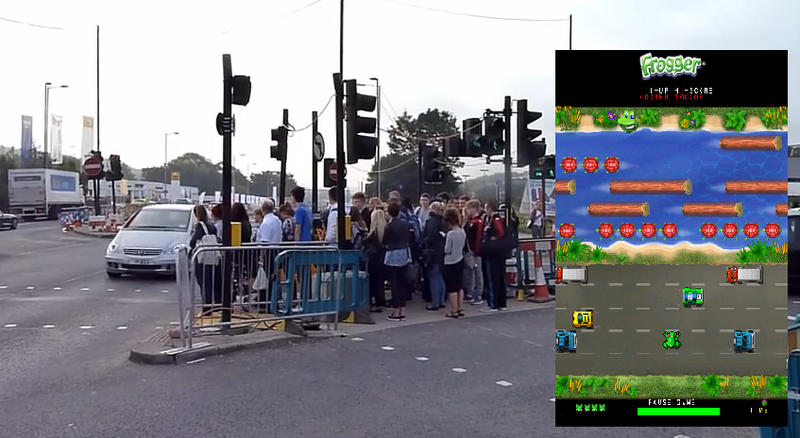 It takes 4 minutes to get across if you wait for the green man at each stage. In this video, crossing #2 (removed) is in the top left corner. Crossing #1 is in the main window. So, in summary: Not good at all. The experience of walking or cycling around the campus is not a positive experience. Car movement prevails, and the Masterplan must give maximum priority to redressing this imbalance. 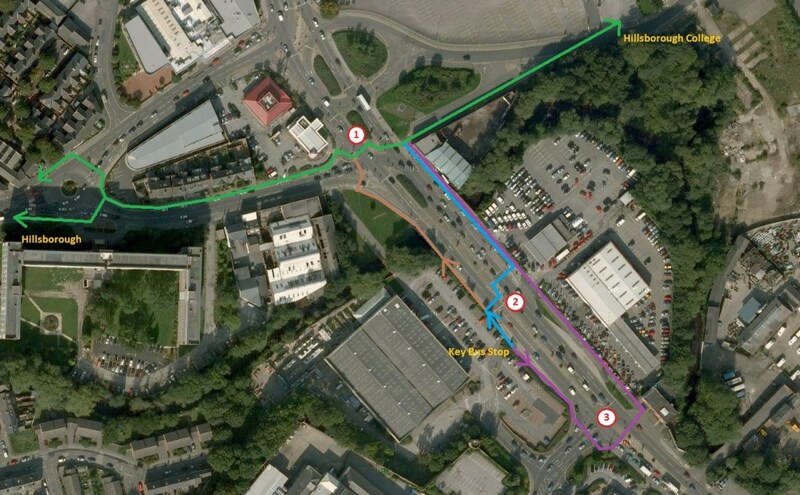 Sheffield University Masterplan – Convenient well placed crossings on desire lines. This entry was posted in Penistone Road on September 30, 2014 by Matt.